Ride to Work Day 2011 provided a great oppoptunity for HBK to hit the road. The Mawson Place breakfast saw Lance, Steve and Sam dishing out some bike care and having a chat with many of morning crowd to spread the good word of Bike Kitchening. But that wasn’t enough for Lance, he had his long bike loaded and so he fitted in an afternoon session for the travellers heading up the South Hobart Rivulet track and setup a mini session there between 5-6pm. He provided oil or air to about 10 people, and chatted to about another 5-10 about stuff. Which, I’m sure you’ll agree, made it a highly succesful bike hour! All the gear you can see Lance carried on the bike. 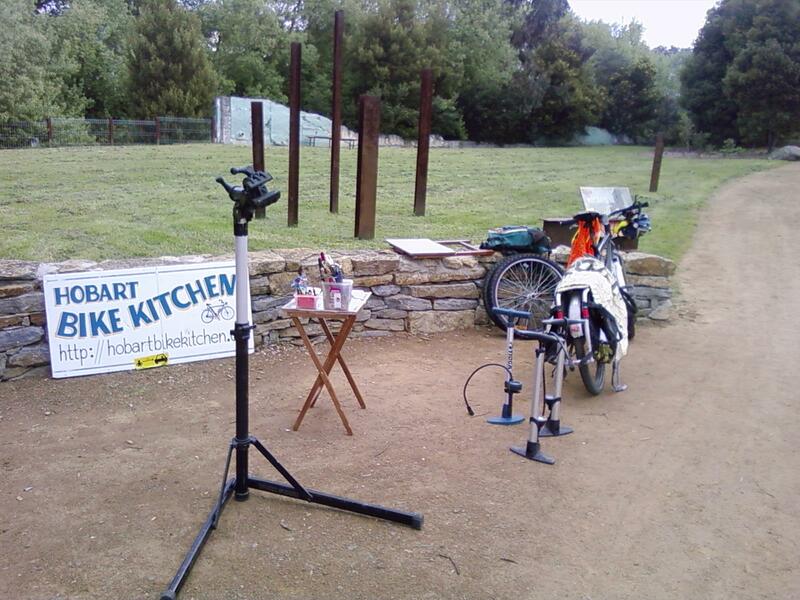 Thanks very much Lance for taking the HBK message to the streets, but also for a terrific lesson in bike packing. Next Next post: Convert your bike to an e-bike!